Notes: Hanwell Castle was not a castle but a house with ornamental battlements, originally called Hanwell House or Hall. 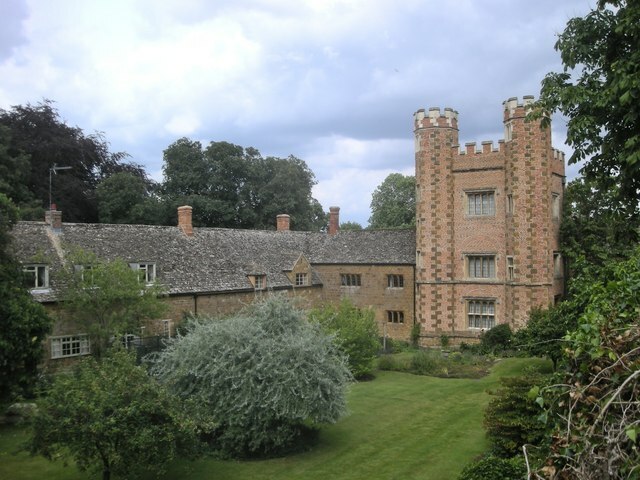 William Cope began building it in 1498, the year he had received the manor of Hanwell from the Duke of Suffolk. It is the earliest example of a brick building in north Oxfordshire. It was a large house with west, north and south ranges around a central quadrangle. Jennifer Sherwood and Nikolaus Pevsner contend that there was an east range but Mary Lobel et al. maintain that there was none. The house has fishponds fed by the village spring. The Cope family had links with Catherine Parr (1512-48), the sixth and last wife of Henry VIII. Sir Anthony Cope, 1st Baronet entertained James I at Hanwell House in 1605 and 1612, and at the castle Sir William Cope, 2nd Baronet entertained James I in 1616 and Charles I in 1637. Late in the 18th century most of Hanwell Castle was demolished. The western part of the south range was retained as a farmhouse, and in 1902 some restoration and extensions were made to the surviving building.It is now a Grade II listed building. In 2015 renovation work at Tudor Cottage in the village revealed the broken remains of a stone relief of a Tudor coat of arms believed to have come from the castle. The relief is finely carved from clunch and is described as being of "national importance", but has not been dated with certainty as parts are missing. The cricket player George Berkeley lived at the castle until his death in 1955.